Rapid Response Squad operatives of the Lagos State Police Command yesterday recovered an AK 47 rifle from three young men in Apapa Area of Lagos State just as it arrested a 23 – year old bag snatcher on Friday in Alagba during a botch operation. The operatives, who were on routine patrol of Apapa sighted three young men at around 11:00 p.m on Friday carrying a bag. The officers accosted the men but the suspects on sighting officers dropped the bag and fled the scene. A check on the content of the bag revealed an AK – 47. No ammunition was found in the bag. 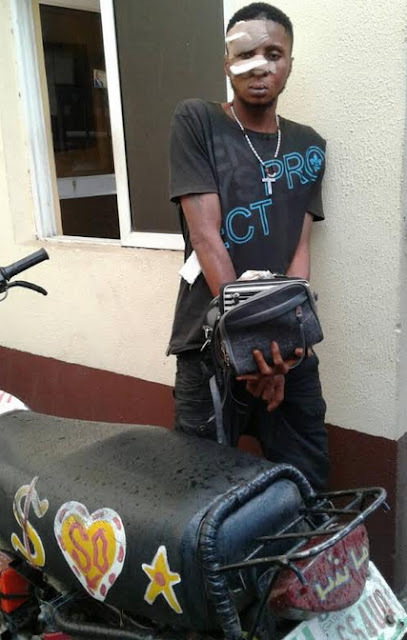 Meanwhile, the suspected okada robber, Ayobami Adedeji was chased by the operatives on routine patrol of Kola Bus Stop, in Alagbado Area of Lagos, after snatching a hand bag around 10:00 p.m.
Adedeji, in company of an accomplice, who he referred to as Aboki, had on Monday night, operating with a motor cycle, snatched the hand bag of one Kudirat Oyebade at Kola Bus Stop. 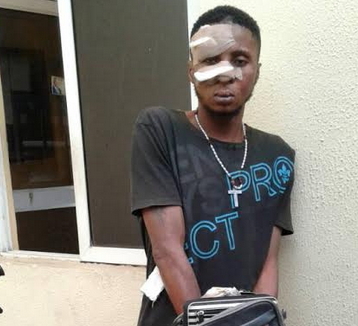 Adedeji, who snatched the bag stated “I was a bus conductor. I went to Kotangoa market on Monday to meet Aboki about how to raise money for ourselves. “We had snatched two bags and my colleague was keeping the money before our last botched operation. 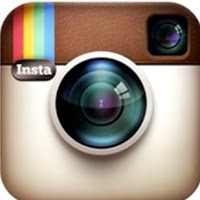 This was our first time,” he stated. “Unfortunately for me, I didn’t know RRS operatives were monitoring us. I snatched the bag and they chased us into the streets. My colleague escaped after abandoning his okada and I was arrested”, he added. TRUST NAIJA POLICE AT YOUR OWN PERIL..HOW DID HE EVEN GET THE AK GUN?MUMU,WHAT HAVE BEING SCHOOL DROP OUT HAVE TO DO WITH ROBBERY..GATES,WORLDS RICHEST MAN WAS A DROP OUT SAME AS BUFFET.U CAN COUNT BILLIONAIRES WITHOUT SCHOOL CERTIFICATE..EVEN OUR LONDON BASED PRESIDENT COULD SHOW HIS SEC SCH CERTIFICATE BUT IS COOLONG OFF IN UK WITH OUR COMMON WEALTH..PLEASE THROW HIM IN THE DEN WHERE HE BELONGS..
END OF THE ROAD FOR YOU GUY. So if you are a school drop out with a single parent, you did not see anything meaninful to do other than robbing people of their hard earned money to make a living for yourself? What about those who are now orphans yet fend very well for themselves doing legitimate jobs and making it? And one look at this guy, tells how hungry, determined and wicked he could be. He would be so merciless with his victims just like Evans. He wasn‘t carring that AK 47 for fancy. If you mess with him, he‘s ready to mess your life up straight, no time! Hand-bag-snacther you are very stupid. Are you the only person without mother. You are a bad criminal. I thank Allah you are not the one with that AK47, if not, you can kill your victim, because by your physical appearence: No Mercy. That`s who you are. I hope that wound on your face was as a result of the sin of your harbit after struggling to run away. Stupid boys, c your life!